JOSEPH B. DAUDA, Minister for Foreign Affairs and International Cooperation of Sierra Leone, said that amidst all the security challenges and global economic uncertainties, Africa continued to strive hard to contain and address resurgent conflicts by peaceful means. At the regional and subregional levels, the past year had been marred by sporadic terrorist strikes by extremists, which had led to extensive loss of life and massive destruction of property. 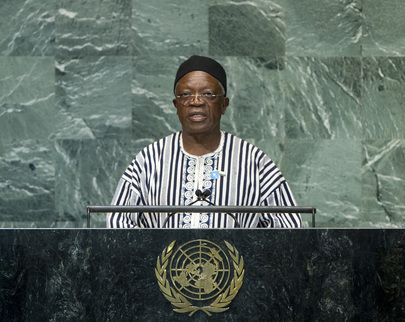 Sierra Leone condemned such terrorist acts and would continue to work with its partners, particularly within the framework of the Mano River Union, ECOWAS, the African Union and the United Nations, in seeking a lasting solution. He said his country would continue to embrace mediation and other conflict-prevention initiatives in settling disputes and preventing and resolving conflict. It would remain strongly committed to the rule of law, respect for and protection of human rights, gender equality and the empowerment of women. Sierra Leone was also committed to equal access to justice, zero tolerance for corruption, pursuit of internationally agreed development targets, including the Millennium Development Goals, and ensuring participatory governance, as well as free, fair, transparent and credible elections. Despite the onerous challenges facing the global community, Sierra Leone had recorded significant progress in strengthening its political and economic governance, including improvement in its social indicators, he stated. Foreign direct investment in various sectors of the economy, notably mining, was brightening the country’s economic prospects and hopefully would place it among the world’s fastest-growing economies in the next few years. The “Agenda for Change” continued to provide a strong partnership link between Sierra Leone and the United Nations, as well as other international development partners, he said. The Government also continued to uphold the principles of inter-religious tolerance and peaceful coexistence, as well as respect for human rights and fundamental freedoms. At the national level, the Government had enhanced political stability by strengthening good governance institutions, giving them sufficient leverage and latitude to deliver on their respective statutory mandates, he continued. It had established the National Commission for Disabled Persons and enacted the Sexual Offenses Act 2012 to address sexual violence against women and girls. As for the presidential, parliamentary and local elections slated for 17 November, he said preparations were in “full gear”, with the support of bilateral and multilateral partners. They would be the third elections held in the decade that had followed the end of the country’s civil conflict, he pointed out, adding that the Government was fully aware that the conduct and outcome of the elections would be a critical benchmark for assessing the gains made in peace consolidation and democracy.